Country Glen Lodge - your Christchurch motel accommodation - is a fully Kiwi run business and our staff have an expansive knowledge of the Christchurch and Canterbury region; we'll help you make the most of your stay here. We endeavour to provide you with a 'home away from home' - so sit back and let us do the work to ensure you have a fun filled experience! Christchurch is New Zealand's second largest urban area, and is a superb location from which to explore Canterbury on your South Island holiday. With fantastic history, art, boutique shopping in our new container mall which is a must visit, cafés and restaurants to explore there is something here for everyone. The Canterbury region is famous for its vineyards, unspoilt lakes and mountains, skiing, cycling, wilderness walks and many South Island tour options. Country Glen Lodge - your central Christchurch motel - would be happy to assist you in planning tours, rental cars and other services during your holiday - please contact us for more information. 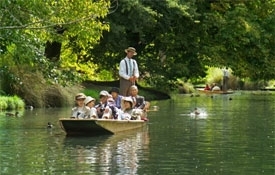 Take out a canoe, kayak, paddle boat or traditional rowboat or Canadian canoe on the Avon River to see the beauty of Christchurch Botanic Gardens. Double and single kayaks available. They also offer cycle hire with flexible hire times from an hour to a week or more. Perhaps just sit back with breakfast, brunch, lunch or a cappucino and unwind by the Avon River at the licensed café with great menu selection. Beside Christchurch Botanic Gardens, across from Christchurch public hospital. Open 7 days. 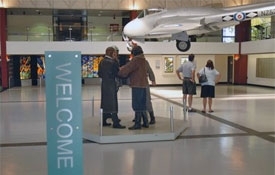 Discover one of the world's premiere military aviation collections at the Air Force Museum of New Zealand; from aircraft, engines and assorted displays to medals, pin-ups and parachute-silk wedding dresses. Marvel at the collection of classic aircraft, be inspired by the bravery of present and past servicemen, servicewomen and their families, fly a simulator, take a guided tour and step back in time in a replica 1940s home. Your journey through the Air Force Museum of New Zealand will be something very special. Sit back and relax as your authentic Edwardian punter gently takes you down the Avon River highlighting points of interest along the way. All punt rides take 30 minutes return. With city and park landing sites available you choose what part of the river to explore. 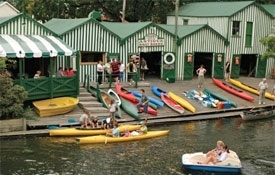 Summer or winter, glide along the peaceful Avon River in Christchurch, wrapped in luxury, as a skilled boatperson propels you through a romantic wonderland. In spring and summer the sunbeams sparkle and ducklings dive; in autumn and winter the river-level view provides magical photographs. 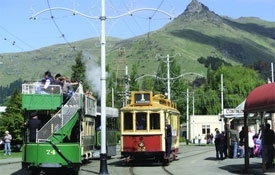 Welcome aboard the Christchurch Tram! Travel on the newly extended track and enjoy this unique and historic way to view the inner city. A full circuit takes 50 minutes, includes 17 stops and there are up to four Trams operating. Trams runs approximately every 15 minutes. Willowbank allows you to experience New Zealand's Wildlife and Culture, together with the Willowbank Wildlife Reserve Ko Tane the Maori Experience, followed by a 4-course dinner with Hangi-cooked mains. A haven amongst the turmoil of the city, Willowbank is in a natural bush-clad area. Just 20 minutes from the central city of Christchurch or 10 minutes from the Airport with FREE return transfers from most motels when purchasing any Ko Tane experience. 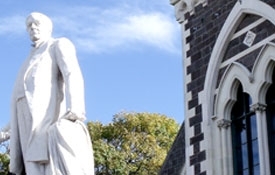 Hassle-free Tours invites you to join them on one of their fun and exciting attractions in and around the Christchurch and Canterbury region. 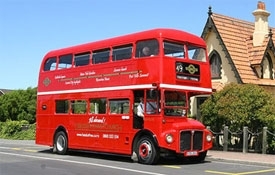 Whether you're looking for a scenic experience into the breathtaking Southern Alps of New Zealand, a visit to a Lord of the Rings filming location or you'd like to discover Christchurch from the top deck of our Classic London Double Decker bus, they have something to suit everyone. They also provide a range of specialised Tours and can custom-design an itinerary for your group. 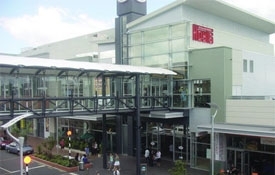 The South Island's only dedicated factory outlet shopping centre, situated at Hornby, Christchurch. Over 60 outlet stores selling best-known brands in fashion, childrenswear, sportswear, adventure wear, footwear, and accessories up to 70% below normal retail prices every day. 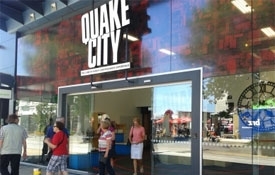 Coordinated by Canterbury Museum, Quake City is a unique multi-sensory attraction aimed at informing, engaging and educating New Zealanders and international tourists about the Canterbury earthquakes. See an active liquefaction volcano and learn about the science of earthquakes. Hear about the incredible resilience of our communities. Be captivated by the stories and photographs of emergency service teams during the aftermath of Canterbury's major earthquakes, and view iconic objects such as the Cathedral Spire. 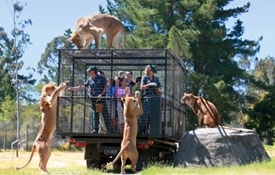 Set in 80 hectares of park-like grounds, Orana Wildlife Park is New Zealand's only open-range zoo. 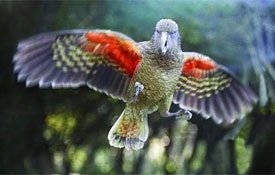 Scheduled animal feeds occur throughout the day and these unique encounters get visitors up close to endangered animals at set times: hand-feed giraffes; see tigers search for food, meet massive rhinoceros in a 'face-to-face' encounter; stroll through native bird aviaries to see a range of NZ forest birds and the kea, the world's only mountain parrot. The International Antarctic Centre is fantastic fun for all ages! 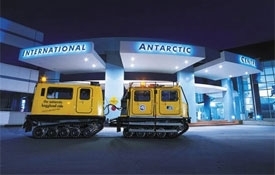 Located in a unique working Antarctic campus the International Antarctic Centre has twice been judged New Zealand's best attraction. Conveniently situated across from Christchurch International Airport, it is the ideal location to "chill out" and experience Antarctica, without even stepping foot on the icy continent. Canterbury Museum is world-renowned for its natural and human history collections. Housed in an exquisite historic building are outstanding Maori exhibits, a Victorian Christchurch Street, an extensive Antarctic collection and interactive fun for the children in Discovery. Dont miss Fred and Myrtle's Paua Shell House at Canterbury Museum for the story of an iconic Kiwi couple and their paua shell lounge. 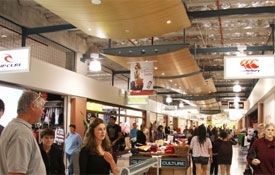 If you like the best shops, you'll absolutely love Westfield Riccarton. You'll find over 180 premium stores and cafés in one perfectly central place, just moments from the CBD and within 10 minutes of the airport. Stroll the heritage village with its church, school house, bakery, jail, homes, printers, grocery store, post office and railway station — a snapshot of Christchurch life in the early 1900s. Explore the fascinating collections in the specialty museums, including aeronautics, fire engines, rural history, Hall of Wheels and model railroad. 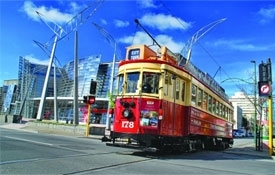 Trams run 7 days per week. Browse timeless treasures and treats in the gift shop, bring a picnic or enjoy a snack in the rose garden, or try sweet and savoury food baked in a wood-fired oven. Ko Tane The Maori Cultural Experience will take you into the heart of Maori spirituality, land, water, forest, wildlife and, most importantly, people. 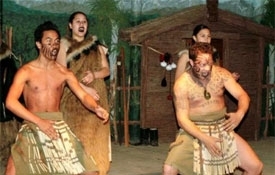 You are invited on a spiritual journey of engagement with the Maori of the South Island, as you experience: Stories of Maori Spirituality and Beliefs, Traditional Greeting onto the Pa (village), Portrayal of Maori lifestyle, A Maori Cultural Performance, Wildlife Tour (optional), 4-course dinner with Hangi cooked mains, Transport to and from Ko Tane from most accomodation. The Rail Trail takes you through a changing landscape that has seen a thousand years of human history. It passes through rural areas and settlements on the Canterbury Plains, skirts past the massive flanks of the ancient volcanoes which make up the Banks Peninsula, and hugs the shoreline of a vast lagoon, Te Waihora/Lake Ellesmere, and its smaller twin, Te Roto o Wairewa/Lake Forsyth. 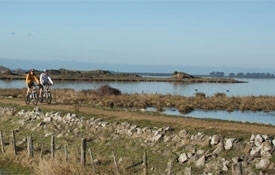 The lakes and associated rivers and wetlands are rich in wildlife and natural vegetation. Country Glen Lodge is happy to provide any information you need, or help with planning, your activities during your stay. Please contact us for more information.